This Los Angeles ceremony location is a massive contemporary Roman Catholic cathedral opened in 2002 with many modern design features by renowned architect Rafael Moneo. Notable are its 25-ton bronze entry doors, polished concrete floors, 85-foot high cedar ceilings, alabaster windows, and concrete walls the color of sun-baked adobe - all of which create unique opportunities for amazing wedding photographs! This Persian bride and groom portrait was taken after the ceremony at Cathedral of Our Lady of the Angelsin Los Angeles at the entrance door to the main sanctuary. The almost all black and white color scheme makes the pink of the bride's bouquet and the groom's boutineer pop. We used the dark wall in the foreground to add depth to the image. 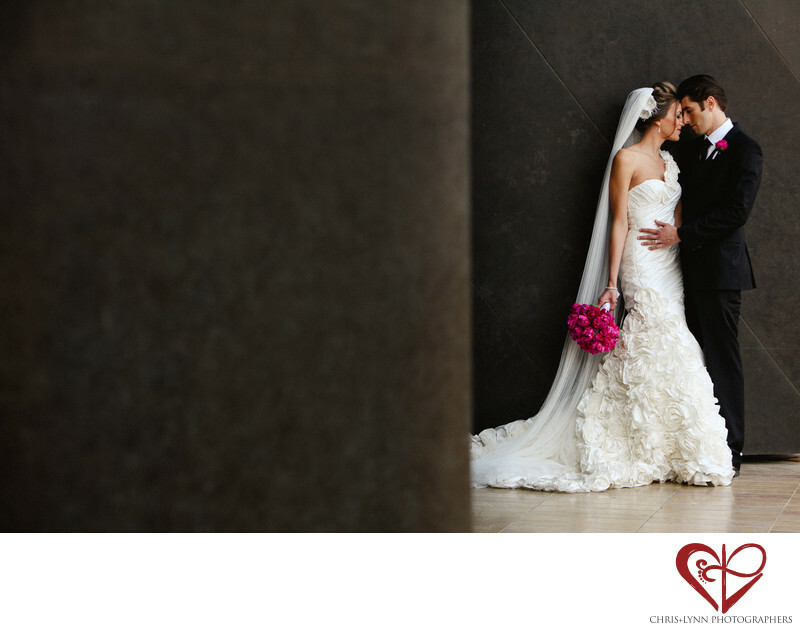 The wall was also used to create the negative space, simplifying the overall composition and focusing the eye on the couple. And what a gorgeous, in-love couple they are! There is an intensity to their connection that we felt throughout the day and particularly at this moment when the groom leaned into the bride and they both closed their eyes to savor this moment. 1/320; f/5.6; ISO 400; 95.0 mm.